Editor's Note: Do not read this article and attempt to conduct a prescribed burn on your property without proper training and/or assistance. Always consult with your area's state forestry commission representative or an independent forestry consulting service before conducting a prescribed burn. Of all the management practices one can do to attract and hold wild turkeys on a particular piece of property, few hold a candle to prescribed burning. The first time I hunted in a freshly burned pine plantation, I was amazed to watch a longbeard strut through still smoldering logjams. In the early morning light, his jet black body seemed to disappear at times in the midst of a sea of charred undergrowth. And after my shotgun ended the hunt, and the turkey began to flop on the forest floor, the ashes turned him completely black. In the years since that hunt, I have become a prescribed burn pyromaniac. As the pine plantations in our property matured to the age to become burned, we seized the opportunity to conduct the vital management practice. It has become an integral part of our management strategy. We now typically burn every plantation we can in the weeks leading up to turkey season. It is a game changer for us. Sadler McGraw of Camden, Alabama is a name many turkey hunters may recognize because of his accomplishments in the turkey calling circuit as well as in the field. When he isn’t on the stage or in the woods, the 2012 World Champion caller is a forester, assisting landowners in their management of their timber. McGraw is a believer in the usage of prescribed burns for managing wild turkeys. "Prescribed burning is beneficial for wild turkeys for a number of reasons," says McGraw. "Wild turkeys cannot fully utilize pine plantations that have heavy undergrowth, and prescribed burns help clear up some of the understory to allow them the ability to move around in the plantation. Secondly, by burning off the mat of pine needles that have accumulated over the years, you open up the forest floor for new, tender growth, which turkeys really flock to. It's almost like having a green field inside a pine plantation." Pine plantations, however, are not the only land types that prescribed burns can benefit. "We recommend doing burns on old fallow fields in addition to burning pines. Burning fields removes old grasses and just like burning pines, encourages new fresh growth. Many of these grasses include native warm season grasses that will provide excellent nesting and brood rearing habitat within a couple of months of the burn. Keep in mind grass fires can get very hot though, and thus are risky," says McGraw. Prescribed burns are not something you do without proper training or assistance. Because of the danger and liability that accompanies conducting a prescribed burn, McGraw recommends having your local forestry service agent or a licensed burn specialist assist you in burning. "There are so many factors to consider when conducting a prescribed burn. You don't simply read a crash course article and go do a burn. The consequences of doing so without proper training or assistance from a professional can be dire," warns McGraw. "Not only can you get a fire too hot and harm the trees, but you run the risk of harming yourself or others via either the fire itself or the smoke it produces. Many timber companies have stopped doing prescribed burns altogether because of the liability. But if done correctly and with the proper precautions and conditions, few things can help wild turkeys more. Again, make sure to hire a professional the first time and learn how to call in the permits with the state forestry commission and execute the burn." 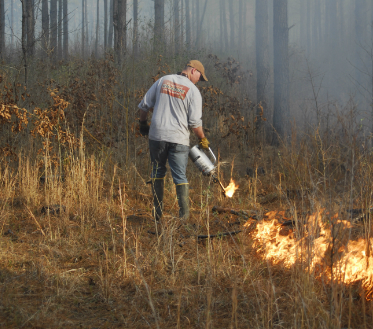 Prescribed burns in the Deep South typically start in December and run through mid-March. The later you burn, the more you run the risk of having a hot fire because of the steadily increasing daytime temperatures. Also, "fuel" in the understory is a major consideration. Some plantations simply have so much fuel that conditions have to be absolutely perfect to burn to avoid scorching the trees. Because heat is always a concern, we typically utilize the "backfiring" technique on my property, in which the fire line is lit on the edge of the firelane against the wind, allowing it to slowly and lowly "walk" back through the pine plantation. Even though backfiring does manage the heat level, it still has it perils. "I have seen the wind switch in the blink of an eye and a cool backfire turns into a hot head fire," says McGraw. "Again, there are so many things to consider that you should never, ever do a prescribed burn on your land if you do not know what you are doing. The forestry service is a great asset, as well as local forestry or habitat management companies. Many states will offer courses on getting your prescribed burning license. If you plan on making prescribed burns a part of your management portfolio for wild turkeys, you may want to complete one of these courses."